Buy leather watch bands, leather watch straps, alligator watch straps, crocodile watch straps with sizes of 16mm, 18mm, 19mm, 20mm, 22mm, 24mm watch bands, watch straps at VANGOSEDUN. We only offer high-quality and high-end handmade leather watch bands, leather watch straps to our consumers. We strive to make your shopping experience a positive one by providing first class customer service and high-quality leather bands! Through our commitment, experience, and expertise we want to establish a relationship with our customers that will last a lifetime and see our watch bands worn on wrists all across the world. The leather is a soft and supple material that is comfortable against the skin. It does not cause skin irritation like some metals do, and it is more flexible than many other types of watch bands. Here, at VANGOSEDUN you can choose from the rainbow of colors, sizes and styles of genuine crocodile leather watch bands, ostrich leather watch bands, lizard leather watch bands, Italian calfskin leather watch straps to fit Michele, Cartier, Concord, Omega and other watch brands. Highest quality, double leather construction, stitched with glued and stitched keepers and anti-allergenic buckles. Largest assortment of quick release – no tools leather watch bands. Whether you want to update the look of your watch with a new watch band, or your watch band has been worn beyond recognition and is broken or falling apart, you’ll find the perfect watch band replacement you’re looking for at VANGOSEDUN. Instead of throwing away your beloved watch, simply rejuvenate it with a new watch band: it will save you both time and money when you get a replacement watch strap instead of a whole new watch. Crocodile, alligator, ostrich and lizard symbolize wealth and prestigious status and very popular in the world of luxury. Many of these materials are covered by the CITES Convention, which means that these leathers come from farmed animals bred under permanent, strict control of official authorities and preserve the wild species. These high-quality materials have a natural surface structure which is accentuated further by the craftsmanship and finishing applied by the manufacturer. Since all of these materials are unique, each leather has its very own character, such as a specific color shade or surface structure. Each watch strap is unique; a coveted and highly appreciated original. 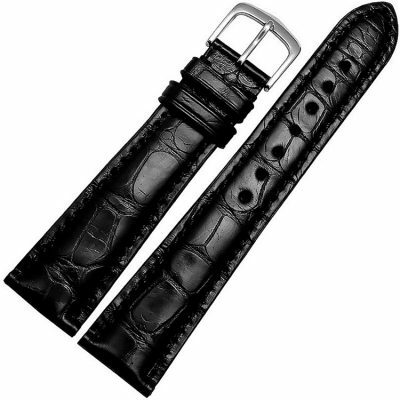 Genuine alligator leather watch bands are both noble and elegant. Each band is crafted from real alligator skin that is treated and colored to keep beauty and design of the genuine skin. 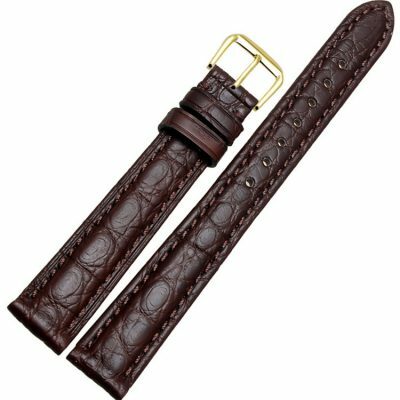 (alligator leather watch band has a built-in texture from the natural scale pattern of the alligator. This adds visual pop that helps to set the watch band apart from ordinary cowhide and catches the attention of high-fashion accessory lovers ). Genuine ostrich leather bands are rare and expensive. Ostrich is a type of leather that is less common even than crocodile and snakeskin. Ostrich looks and feels like regular leather even though it comes from a bird. However, the ostrich has a pattern of regularly spaced divots all over the leather, which is from the feathers. Because of these divots, which add to the style and value of ostrich. 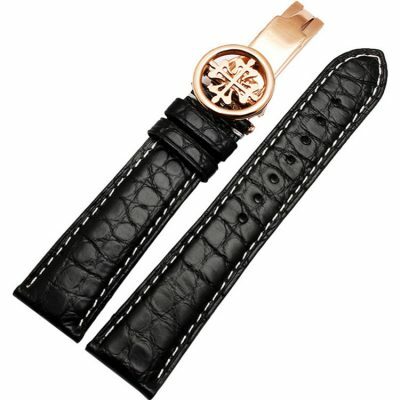 Genuine snakeskin watch bands are luxury and richness. Snakeskin has a pattern of small scales, which may differ in color. Like the crocodile, snakeskin is often used in high-fashion designs, so it is a great option for those who want their watch band to add luxury and richness. Genuine lizard leather watch bands are available in many colors. They’re prized for their unique grains and natural beauty. We have a variety of colors and lengths available in lizard grain. Calfskin leather watch bands are known for their supple leather. They’re the most common type of watch band and come in a variety of colors as well as embossed textures. Watch is considered as one of the most important accessories that you can ever have. It can help you organize your daily activities for you to finish them on time and on schedule. There are watches that have leather bands. You have to realize that if you have this type of watch, you must clean it often since it becomes dirty easily. There are a few steps that you need to do for you to be able to clean your watch with a leather band.
. The first thing that you must remember all the time is to remove your watch before you go to bed or before you take a bath. This technique allows the leather band to be ventilated. You also need to clean the band for at least once a week with a damp cloth and allow it to dry.
. If you want to clean the band completely, you need to remove the pins that hold the band. Try to get some help if you do not know how to do it. Heavy stains can be removed by making simple homemade paste out of baking soda and water.
. Try to add one tablespoon of baking soda with the equal amount of water. You need to rub the paste on all parts of the band. Let it stay in the band overnight. Always remember that you need to wash it after and allow it to dry completely before attaching the band with the watch.
. If the watch is completely dried, try to rub some saddle soap. Saddle soap helps to restore the good condition of the band. It makes the band look good again. You can get this from stores near you. If there is no saddle soap available, try to use olive oil instead.
. Watch experts suggest that watches should be cleaned every 2 months using a dry and soft cloth. If your watchband is leather, never wet the band. Bear in mind that leather shrink when they get wet.
. The last thing that you need to do is to wipe the band a with dry cloth. This will greatly help you to polish your watchband. It is important to clean the watchband of your leather watch in order to keep it in excellent shape. There are many ways in cleaning your leather band. You just need to follow them carefully so that you will be able to clean the band effectively. This will help you maintain the good condition of your watch. Watches indeed are valuable items that need proper maintenance. Whether you own a luxury watch or a simple timepiece, you should always observe the proper ways of taking care of your everyday buddy. Today, we live in a fast-paced world where watches can give a lot of ease. It really pays to be careful enough in using and maintaining your watch. For sure, you wouldn’t want to frequently look for a watch service or buy a new watch due to your own carelessness. 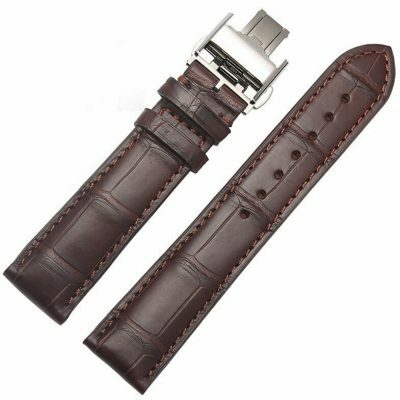 Related search: leather watch bands, leather watch straps, watch bands, watch band, watch straps, watch strap, 22mm watch bands, 20mm watch bands, crocodile watch straps, alligator watch straps, alligator watch bands, crocodile watch bands, crocodile watch bands, alligator watch bands, ostrich leather watch bands, snakeskin watch bands, leather watch bands online.